I've recently been travelling in Europe with my family who were visiting from Australia. They were keen to see Italy, so we spent the best part of a week there. The good thing about having my 10 year old nephew in tow was that there was always an excuse to stop for gelato, even if trying to narrow down the selection to just two or three flavours at a time proved a challenge. While we only had time to visit Florence and Rome, we still managed to spend a good deal of it with a cone or cup in our hands. 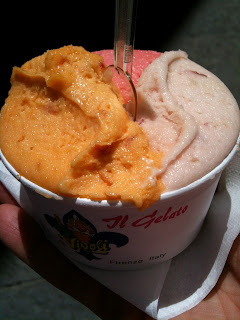 So while this is just a mini review of the gelati we ate, the quality in Florence was far superior, and cheaper, to that in Rome, and the beautiful Vivoli was my favourite with its strikingly fresh fruity flavours. By some happy coincidence the apartment we rented in Florence, which was within striking distance of the OTT façade of Santa Croce, was also basically wedged between two of the best gelateria in the city - Vivoli and Gelateria dei Neri. Given the proximity, these were the two we gravitated towards when the urge for gelati struck. We also tried Carabe up near the central market after a knockout meal at Trattoria Mario where the veal chop will live long in my memory, and that of my mums. Our first gelato came within minutes of plonking our gear down in the apartment. 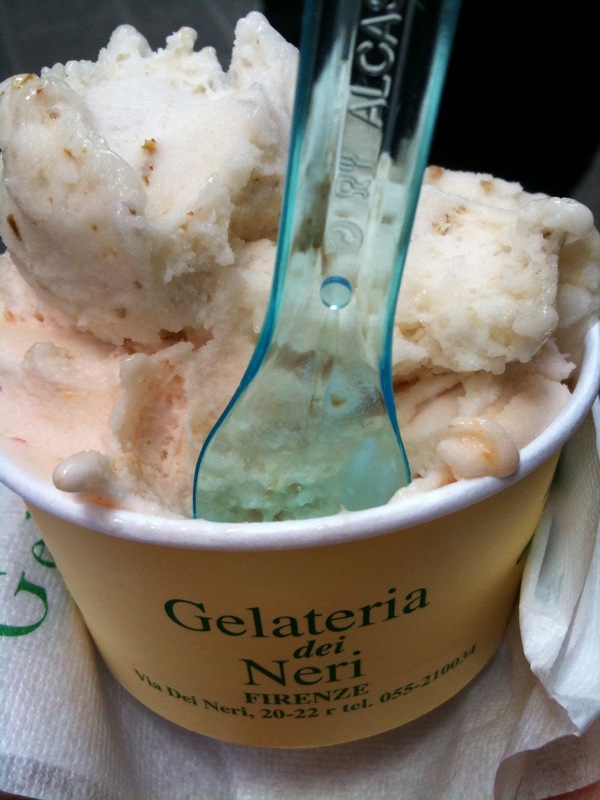 Gelateria dei Neri champions the semifreddo style but also stocks enough granita to satisfy your icy fix if that floats your boat. The small interior had dozens of flavours, making the choice all that more challenging for a first stop. 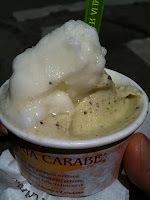 The pear and melon gelati that I went with had good ripe fruity flavours and were delicious. Definitely a place to visit if you're finishing off a tour of the Uffizi which is only a five minute walk away. A short walk in the other direction from our apartment brought us to Vivoli where we ate the best gelati in Florence, and the best of our short trip. The melon was outstanding and I was gutted when it wasn't in the tubs one day. I guess if you can't source enough raw material on a particular day then you don't make the flavour, which is commendable, if a little disappointing to those of us with a habitual streak. We had breakfast almost every day at Vivoli too. They had fantastic home-made custard-filled, still-warm cornetti and candied orange peel filled brioche. It was dirt cheap too if you downed your cappuccino standing at the small bar area. After Vivoli, Carabe left little impression on me to be honest. Maybe it was the afterglow of the veal chop and cheap house wine from Mario that dulled my tastebuds. Lemon and pistachio were fine but didn't zing for me. On my last trip to Rome, which was about three years ago, we stayed near the famous Giolitti, which is close to the Pantheon. I couldn't get enough of the pear flavour that time, but this time around I found it slightly underwhelming. It didn't have the right hairy flavour I loved when I first ate it. You know what I mean by hairy, right? When you bite into a fresh pear, there is that slight chalky texture which is on the good side of gritty. Replicating that texture in gelati is an art and I think Giolitti may have lost it. We also tried the gelato at Il Gelato di San Crispino. It's quite a cool set up as you walk in with all the creamy treasures hidden under stainless steel topped vats, although you have to use your imagination when it comes to flavours. 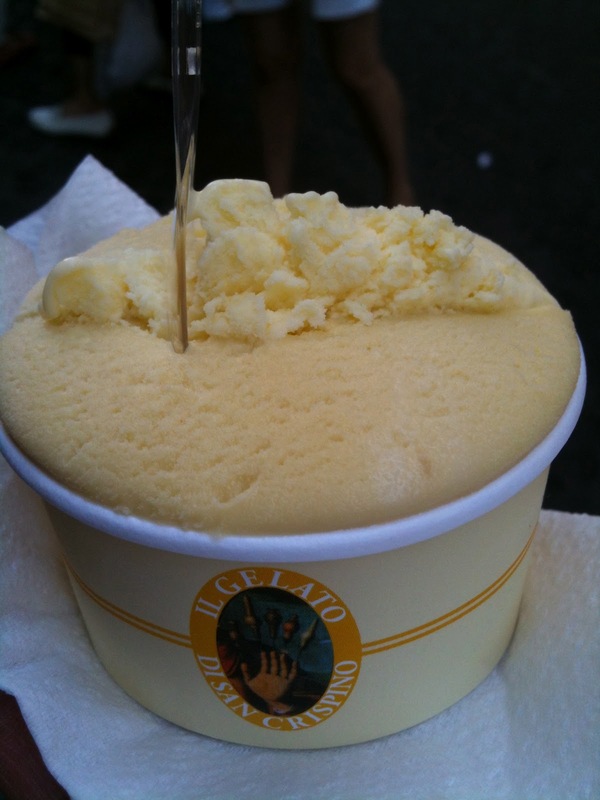 I also remember sampling the treats there on my last Rome trip and being impressed, but preferring Giolitti. 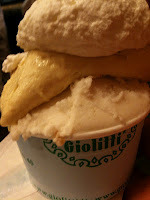 I still preferred Giolitti to San Crispino where the portions were a little stingy and the flavours were just ok. Maybe they are resting on their Roman laurels, or just more focused on selling t-shirts to the German tour groups fresh from the Trevi fountain photo op. I like the more old school set up at Giolitti with its patisserie selection and cafe. Despite the frenzy there, it's the better choice if you're on the tourist trail. Back in London, I'm not longing for the gelato of Italy that much. Gelupo in Soho, with its ever-changing flavour combinations, fills that void just fine. So if you're not in Florence anytime soon, just head down to Picadilly Circus. If you're lucky, the ricotta and sour cherry will be on.